Job J4P1475, Rte 49, Cass County was a project designed to construct a new diverging diamond interchange at the location of Highway 291 and I-49 in Harrisonville, MO funded by both MoDOT and the City of Harrisonville. 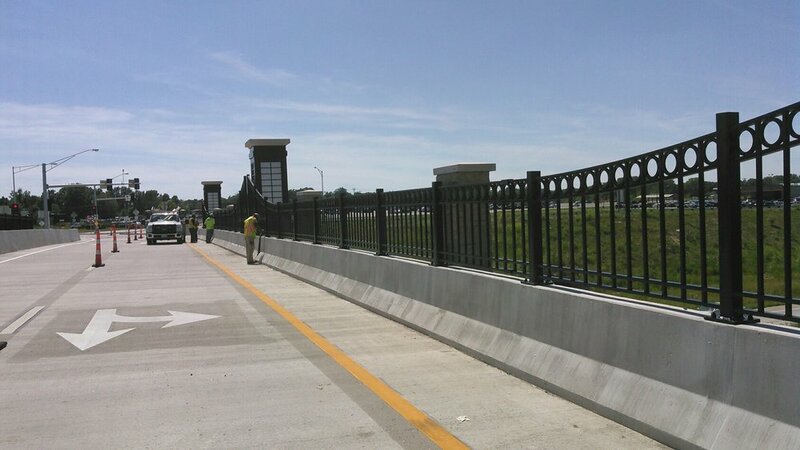 It consisted of over 56,800 SY of new concrete pavement and widening along with the construction of two new 193 LF, two span concrete I-girder bridges over I-49, two new concrete box culverts, and over 147,000 CY of earthwork needed to bring the existing grade up to the elevations needed to tie in the ramps and existing streets to the new bridges. Other items of work on this project included new sidewalks, various entrances to existing businesses along the route, storm sewer improvements, waterline improvements, sanitary sewer improvements, as well as ornamental fixtures, fencing and appurtenances for the new bridges. The total contract amount for this project was over $13.8 million which took one year and 8 months to construct from beginning to end. During the course of the project, we received several quality assurance bonuses for concrete pavement quality. This project had several difficulties to overcome with the amount of existing traffic through this area and in order to accomplish this, there was quite a bit of traffic control and pavement marking phases that had to be employed to keep traffic moving through the area which made construction of the new pavement fairly challenging. The earthwork that took place also had to have some phasing applied in order to bring in fill to connect some of the existing roadway to the elevation of the new bridges all while making sure traffic could still use the existing bridge to access I-49 and Cantrell Road which lies to the southwest of I-49. This required the box culverts to be built one half at a time while building up the fill and that presented its own challenges for construction. This interchange project now provides better traffic flow through as well as safety improvements in the area. At the same time, the project has provided many aesthetic and infrastructure improvements for the City of Harrisonville which they can be proud of.